The Greater Kudu, Tragelaphus Strepsiceros, is the third largest antelope in Kruger Park, after the Eland and Roan Antelope. The Kudu is an elegant antelope with bulls having magnificent spiral horns that can grow up to 1.75 metres long. Its coat is fawn-coloured with the sides of the body boldly marked with white vertical stripes. A conspicuous white stripe runs between the eyes. It is called the Greater Kudu as there is a smaller species called the Lesser Kudu found in East and Central Africa. The Greater Kudu is predominantly a browser (eating fresh grass shoots only when leaves are scarce) and is a prolific jumper, easily clearing fences of 2 metres. In fact, the S A national road signs depict the kudu to warn motorists to be vigilant when driving near game reserves. Beautiful spiral horns of Kudu bull. 4th November : It was a hot day in Kruger, sightings were difficult but we still nailed 5/5 : 2 White rhinos near Orpen , lions on S100, buffaloes at Mudzandzeni , elephants at Kumane dam and leopard crossing Nsemani dam. We also had a great sighting of a mother black backed jackal and baby. 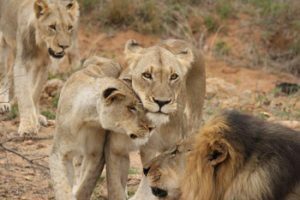 10th : Brilliant sightings : On the S100 a lioness killed a zebra – we saw the whole spectacle which lasted 30min, leopard at Kumane dam, 2 white rhinos Timbavati riverbed, elephants at Sweni, at Mudzandzeni buffaloes drinking and a beautiful secretary bird drinking at Sweni windmill. 21st : Hyenas before Orpen reception , leopard 400m before reception , lions at Mazithi dam eating a warthog , elephants at Sweni windmill , White rhino near Welverdiend windmill. 26th : Brilliant day – enough to make all other safari companies really jealous : Lions on S90 , more lions on S41 eating kudu and also on S100 lying down. 4 Sable Antelope on S39, and 18 Wild Dogs on Rabelais road, 400m before the gate there was a leopard on a tree and under the same tree hyenas. Beautiful Leopard up a tree. 27th : Lions on S100, Leopard at Sweni, White Rhino on S39, Buffalos after Nsemani , more elephants before t junction S36 and S39 and Wild Dogs between Rabelais and Orpen. The Bushveld has finally received much needed rain, bringing welcome relief. The animals no longer struggle to find decent grazing. Although all areas haven’t received large amounts of rain, it is looking far more positive than last year. The zebra and wildebeest are back in Balule. These will, in turn, attract predators, making for improved viewing during game drives. The Kruger Park has provided some great game viewing of late, with guests returning to the lodges with loads of great pictures. Marc’s Treehouse Lodge has the idyllic Klaserie River flowing through it. A leopard and its young cub have been spotted here. 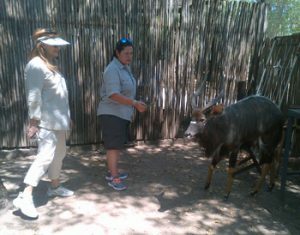 Other animals spotted along the river include kudu, nyala and buffalo. These are often seen during the morning bushwalk. 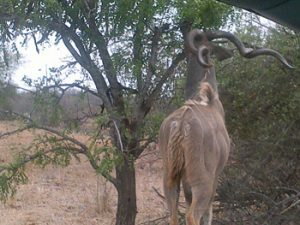 The thriving nyala population is on the increase – a youngster was found at the lodge. The youngster must have only been a few days old, and is already quite used to being around people. Katekani Lodge is set in a beautiful secluded section of private bushveld. The camp is full of bird life as well as a variety of antelope species, with the bushbuck being the most common. Smaller night creatures such as bushbabies can also be seen leaping from tree to tree in the late evenings, calling loudly (somewhat similar to a baby crying). A Dutchman proposed to his fiancé at Katekani this month – they found the lodge to be perfect for such a great step in their lives. Their room was beautifully decorated by our staff, and a private dinner was arranged for them on their special day. 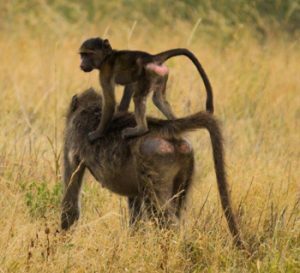 Tremisana Lodge is always a fun place to watch animals with the ever present troop of monkeys providing endless entertainment. The females are almost all with child at the moment – the youngsters cling on tightly to their mothers. Bigger animals such as warthogs are quite happy to walk around in the lodge gardens, using the abundance of tree cover, to keep themselves cool in the hot sun. The Sleep Out Safaris have been a great success, with guests thoroughly enjoying the walks as well as the chance to sleep under the stars in the African bushveld. The new platform and waterhole at Marula Boma are winners ! This month we had amazing sightings in Kruger Park. On the S100 with the availability of water in the Nwanetsi river we see a lot of game. Three lionesses took down a zebra on the road – they left the zebra kill and moved close to my open vehicle to rest before they start feeding. operating on S 100 road. Around the Orpen Gate area we often get to see rhinos and leopards. Orpen is also well known for Wild Dog sightings. We found a pack of 30 lying under a tree and then moved right across the road in front of us. They are in no way frightened by our presence. On the S 145 Talamati road we found three male lions that had just killed two Buffaloes. The rain has set in this month and we have been experiencing a lot of wet safaris. Slowly but surely you can start seeing everything turning from dull grey to a wonderful green. I have had 3 different Wild Dog sightings this month and 4 different Cheetah sightings. We found the dogs close to Orpen on the H7 next to the road and then on the S106 that runs parallel with the H7. The Cheetah were a little more dispersed : one sighting was on the H6 about 13km out and the other three on the H7 Between the S36 turnoff and the S12 (Girivana road). The lion have mostly been on the S100 where I had an amazing sighting of a few lionesses opening up a Zebra and then doing something I haven’t seen before – eating the stomach. This was both gruesome and awesome and also right next to the road. Just a few weeks later we found two huge male lions lying next to the road on the S125, some of the most beautiful males I have seen since starting guiding in Kruger. There are two male leopards between the first boom gate and the Orpen reception area. They seem to be very relaxed with the vehicles and don’t mind showing off to our guests. Some special sightings this month included 3 Sable Antelope on the S39, two females and a young male. I had some really amazing guests this month – a lovely couple from the UK – Margaret and Greg that had a very rainy sleep out and some amazing Kruger trips. Congratulations to all the honeymoon couples that came through Katekani as well as the Dutch couple that got engaged here. I feel very lucky to have been part of your special occasion. The Danay group was amazing and we got to see the big 5. As far as sighting go, November was certainly on steroids in terms of the animals seen. Hopefully next month is just as good! 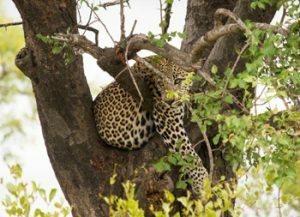 On 12th we observed a Leopard relaxing on a Marula tree near Orpen. On the 24th we saw a mating pair of lions right near the road. 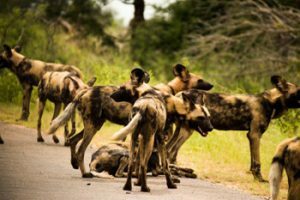 On the 25th we observed a pack of wild dogs relaxing next to the road. On the 2nd of November at Tremisana lodge a herd of buffalo was next to my window for more than 40 minutes. When I left for the bushwalk they had moved to the area around the Warden’s house. On the 10th we saw Wild Dogs on H7 2km from Orpen going towards Satara. We followed them for about 500 metres. On the 12th we found a leopard on a Marula tree next to the road before Orpen reception. On the 15th before Satara we found a cheetah with 2 cubs feeding on an impala. On the 24th we found a pride of 17 lions hunting at a water hole on the S 126. The 27th was a lucky day : Wild Dogs on the H7 and on the S 100 we found a mating pair of lions. On Sweni road we found a leopard with 2 cubs on top of a rock. On H7 18km from Satara we found 30 elephants crossing the road. On H7 near the junction of S36 we found 3 Sable Antelope. Brilliant shot of Wild Dog pack on the road. On the majority of Sunset Drives this month we saw impalas, kudu, steenbok and jackals. We also saw the giraffes feeding on leaves of thorn trees as well as zebra, baboons and duiker. Herds of elephant with young have been around. We spotted many beautifully coloured birds including the lilac breasted roller, woodland kingfisher and a red billed wood hoopoe. 3 female lions have been seen regularly around Tremisana Lodge. The bush is looking good. The trees are green and new grass is growing The animals are enjoying the food and water. On Bush Walks we usually see impalas, waterbuck, giraffes, hippos and crocodile. We also see grey heron, saddle billed stork, fish eagle and hadeda ibis while on bush walks. At Tremisana Dam we saw one male lion and three dead Buffalo, one young female and two big females. The buffalo were so weak because of lack of food that they did not put up a fight to survive. It was a great sighting and the guests were excited about it. On Bush Walks, we see hippo and crocodile out of the water, buffalo on the banks of the Olifants river and numerous bull elephants. On most days we find a troop of baboons. Hitching a ride to the Olifants River. We have seen 2 honey badgers regularly as well as a den with 5 Black-backed Jackal pups. Because of the lack of grass, zebra and wildebeest have been relatively scarce. On Sunset drives, we usually have had sightings of 2 bull elephants at Campfire dam. We have had sightings of a female leopard along Marula road. Marula Boma has been brilliant : The new waterhole at the Boma has attracted all kinds of animals and our guests are always being interrupted from their Bush BBQ to see hyena, porcupine, genet, honey badger, civet. We had a lion sighting, elephants and buffalo drinking while we were eating! 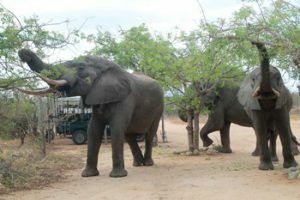 Afternoon drives and Sundowner drives have been more productive than Sunset drives in terms of elephant sightings – a herd of 20 elephants have been seen regularly south of the river and 2 buffalo bulls appear to be full time residents near the Spruit on Rome 1. On some of the Bush Walks I did this month we had really good approaches to elephants and came close to hippos and crocodiles basking in the sun. Morning Drives have been good with a guaranteed sighting of Jackal pups playing outside their den. As it is breeding season we get to hear the magical call of the male red crested korhaan. Afternoon drives have been very productive : Elephants bulls by the riverine area, including mock charge by an elephant bull in musth with a disabled leg. Getting the chance to observe interesting giraffe behaviour: An orphan baby met another mum and rubbed himself against her, at first the mum giraffe ignored him, after 2 days, finding that same scene happening again and the new surrogate mom giraffe allowed him to drink. Got lucky and seeing some wildebeest and African Hawk eagle. Elephants ( breeding herd ) / Hippos getting out of the water / Impala settling down on to the airstrips joined by zebras / Giraffes feeding on the edges of the airstrips/ Foam Nest Frog on Barnard dams / While having sundowners a lonely hyena came across ( probably a young male that has been kicked out ) / Bush babies / Chameleons. Elephants / Buffaloes / Lions / Chameleons / Giraffes / Jackals pups / Scops owl / small spotted genet/ Hyena / Honey Badgers and Porcupine all at Marula Boma. 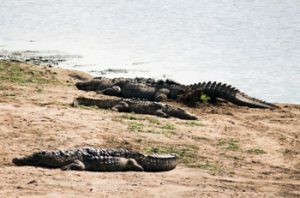 We saw hippo and crocodiles out of water and buffalo bulls near Olifants River and water buck. We saw impala, zebra, Elephants and Buffalo. I conducted safaris into Kruger a few times this month: We spotted Lions, Elephants, Buffalo and Zebra and we also were lucky enough to see leopard. We also saw a few Rhinos with their young that came quite close to us as well as a herd of elephants with their young. The guests were very impressed with the Big Bull Elephants and how close they were for viewing. I always find it so difficult to choose what to write about. I am not the best writer! There is so much happenning in the bush every day that you lose count. We saw a lovely leopard tortoise that appeared after the first good rains. It was good to see the appetite it had ! On an afternoon drive we saw a total of 24 Giraffes. They were busy browsing on the leaves with their almost 25 inch tounges. We were lucky to see how giraffes lie down on the ground. Giraffes don’t really sleep a lot so that’s why it was so interesting. On a Sunset Drive we started with some Elephants – an amazing sighting of a breeding herd passing by with young babies. After dark, we enjoyed a quick glimpse of a bush baby and then a small spotted genet..But the real event was at the Marula Boma where we hold the bush barbQ.We heard lions roaring really close. Everyone was a little scared. Hearing a lion roar from that close distance makes you aware of how much power these big cats have. Tremisana has had some rain and the grass shoots are appearing. Tremisana Dam is full and the lion pride has been seen here frequently as numerous animals drink here throughout the day. The rain has attracted numerous birds including both Diederik and Klaas cuckoos. We are seeing plenty of animals at the Tremisana Boma and our car park has become a bit of a risky place to walk around. Elephants have been around Tremisana just about every day. Elephants eating Marula leaves in Tremisana car park. A buffalo herd has camped here as well. Buffalo having a close look at our Landcruiser in the car park. Bush Walks along the Klaserie River have been very good as many animals are coming down to drink. With the drought conditions, the Nyala are becoming extra tame and visit us all day long including dinner time. A monitor lizard has taken up residence in one of the tree stumps we use to support the thatched roof of our Lapa. The camp has a great romantic feel about it and one of our guests, Frank, proposed to Annemieke last week ! Rachel Buchan, London, United Kingdom. The staff are ALL so lovely and the chef Pierre is FANTASTIC, we cannot praise him highly enough. He created imaginative and tasty dishes each morning, lunch and evening. The only problem is he’s creating such amazing dishes so frequently that you get too full to eat it all! He is very talented and should feel confident in his abilities. What we also loved about Katekani was the intimate setting – they only have six lodges so can host twelve guests – PERFECT. Thank you Mira and Jochen – you were lovely hosts and made the end of our trip in South Africa memorable. Josie K, Cambridge, United Kingdom. 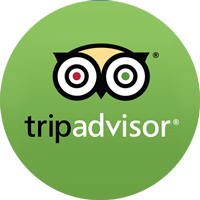 Welcoming staff, well cooked local food, well organised excursions, cheap bar! A good trip for young couples on a budget, also ideal for single travellers. It is pot luck which room you are given on arrival. They vary in size, some are with en-suite some you have venture outside to the loo. We were very lucky with room 7. Ideal spot for views and en-suite. Can be creepy at night, you can hear the hyenas calling while walking in the dark to your room! We also heard a leopard kill and eat a monkey at 2am. Not a luxury stay, but a once in a lifetime experience and we thoroughly enjoyed it. All the basic needs are met, comfortable, warm showers and hot food. TIP – if going in the winter, take LOTS of layers. It is COLD at night. Thank you all for the wonderful and unforgettable moments that we spent with you guys. As a first safari and big five game drive experience for my girlfriend and I, we could not expect a better experience. 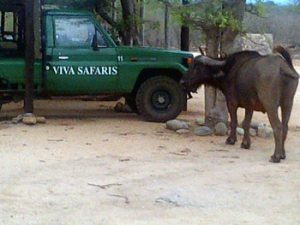 The organization is perfect, Viva Safari really takes care of its guests, so you can fully rest and enjoy your Safari. 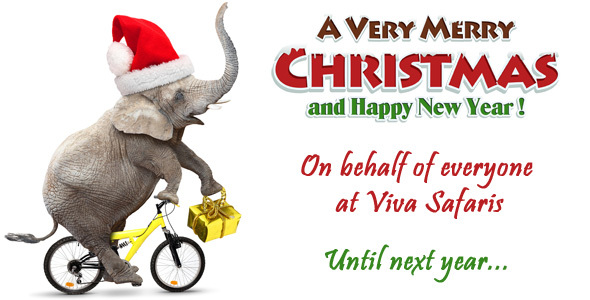 I will definitively recommend Viva Safaris to my family and friends! Special thanks to (sorry for the potential misspellings) : Pretty, Izaia, Raymond, Victor big smile (thanks for the music! ), Sussy, Eva, Pier (great cooker! ), Patrick (congrats for your recent wedding!). We are pleased to confirm that the Adventure camp will be renamed Masango Camp in honour of the late Ronald and will be revamped in December. We shall be offering 3 day safaris at this venue starting 1 January 2017. We thank you for the outstanding support we have had this year – our figures were exceptional ! We shall be having our Orphans party at Tremisana Lodge on 10 December. Pick n Pay has generously agreed to once again give each orphan a goodie box including a take away chicken. They will also sponsor the cake and meat for the BBQ we are holding at Marula Boma. Thanks to Ian Kleinschmidt. The orphans will go on a Bush walk and a game drive followed by the BBQ. Thanks to my wife Sandra, my daughter Michelle and the Virginia and Star of the Sea Confirmation Classes who have sponsored “shoeboxes” filled with toiletries, biscuits and all kinds of wonderful goodies! May Almighty God bless you all abundantly for your great generosity. 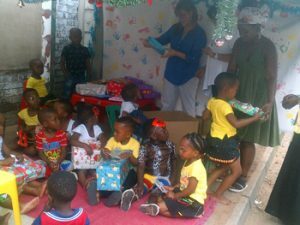 Viva Safaris also contributed to a party for the children at the Archbishop Denis Hurley crèche in one of the poorest areas in Durban.